So I made it back from AERO last week. It was awesome! I really had a blast! Thanks to everyone who stopped by to say hi or to buy a book! There were times where I could barely keep up with signing and chatting. There were lulls too, of course. But as soon as I left my table to get a coffee, go to the toilet or whatever, I could see people approaching my stand from across the room. As soon as I hurried back, they often were gone. So I ended up being pretty much glued to my table and not seeing much of the rest of the show, which was enormous this year. I hope I can convince my brother to accompany me next year. That way one of us would be able to roam the other exhibition halls a bit. But I’m not complaining! It was great to be such a popular target and to meet so many old and new fans! As a cartoonist, I spend most of my days behind my drawing table or computer, so it’s a really nice change to get out and about and meet some actual readers and too get told how much people love your artwork all day long. I really appreciate that! So, if nothing unforeseen happens, I’ll surely be there again next year! Oh, and last but not least: Is today’s comic strip a metaphor on politics? On the business world? On marriage? Or is it just a couple of goofy chickens in an airplane? You decide! 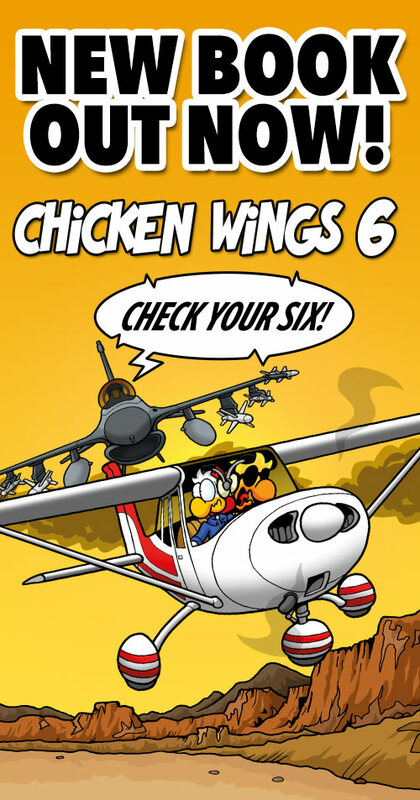 If it’s a political metaphor, a 7th panel would have Chuck sitting in front of a flight standards official and blaming the pilot on the PREVIOUS flight for his clearance violation. Almost sounds like a student pilot trying to get the CFI to fix their bad landing attempt instead of going around. Magnoire, yes, siblings was exactly what I was thinking of. My kids do this every day. Of course, in reality if there is any semblance of CRM, the PIC will always formally initiate the handover. F/O: “Let me fly for a bit.” – PIC: “Sure. You have control” – F/O: “I have control” (takes controls) – PIC: (relinquishes controls). 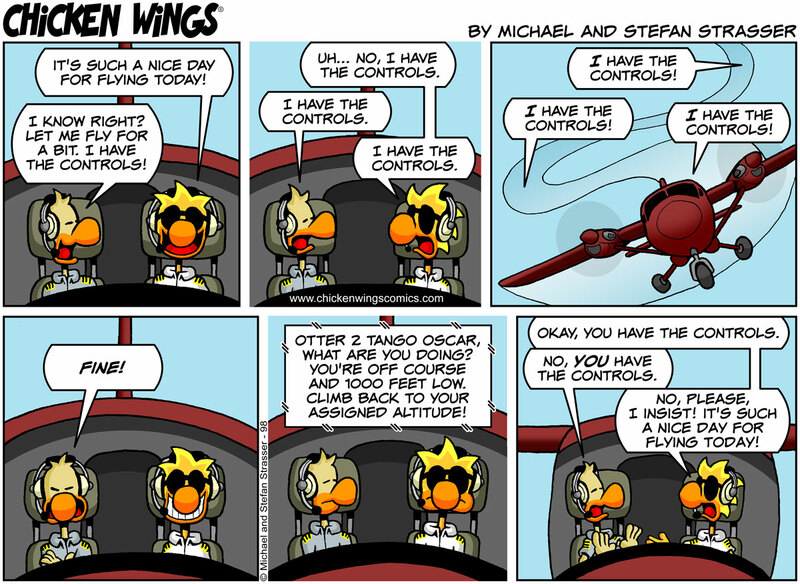 Or, in this case: F/O: “Let me fly for a bit.” – PIC: “Negative.” – F/O: “Aw, man!” (pouts). Any semblance of CRM? In Chuck’s cockpit? Ha! What’s the over / under of Chuckles dying of fractured skull AND spine, about 5 seconds after stepping out of the aircraft when back on the ground?? Nope nope nope. No way he lives….